Brown face in Halloween costumes? Not cool, according to Aziz Ansari, the comedian behind Parks & Recreation’s Tom Haverford, the most spot-on, pitch-perfect and hyphen-hyperbole-inducing portrayal of douchebaggery in a generation. 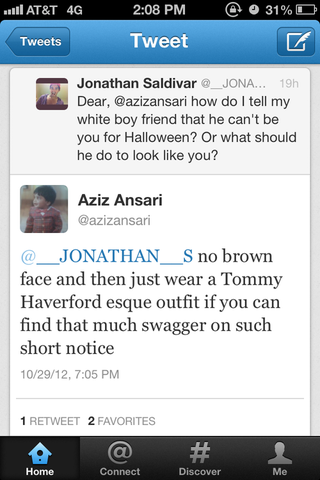 And so, white people, if you want to make a Tom Haverford costume attempt, go on ahead and try to find enough swag to pull it off.